To continue development of the new starship, our scientists require large quantities of both Common Metals and Rare Metals. We have established a mining base in the foothills of a nearby mountain range. This location has rich deposits of both Common Ore and Rare Ore. The area is both seismically and volcanically active, however, and it is simply too dangerous to establish the full colony in this location. The mining base is staffed with some “volunteer” help. A convoy of loaded ConVecs and Cargo Trucks has been sent in to help speed up the mining effort. 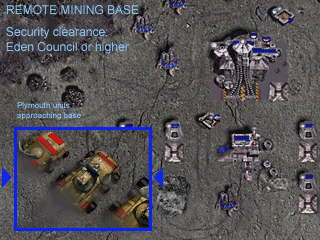 A small complement of armored vehicles has also been dispatched to the location but few robots can be spared from the main colony's defenses and we do not have enough extra resources to support a Structure Factory in the mining base. Satellite observations have shown numerous Plymouth vehicles in the area. Our secret location may not be as secret as we thought. Be prepared to defend the base if the Plymouth units locate it. The increased effect of the Blight is also creating havoc in the skies. Severe electrical storms have been noted by our scientists. These may pose a threat to our base as well. Our projections show what we must do to succeed. Check the Specific Objectives list for details. Have 7500 units of Rare Metals in storage. Have 10000 units of Common Metals in storage.